Not much ruins an outdoor party than the tent breaking. But if that ever happens, it's not the end of the world. Just buy this replacement top and your tent will be as good as new. Made of heavy 15-oz vinyl, this canopy keeps out water, wind, and light. Available in solid white or with 4 different stripe color options, this tent comes with a convenient protective bag designed to store it when not in use. 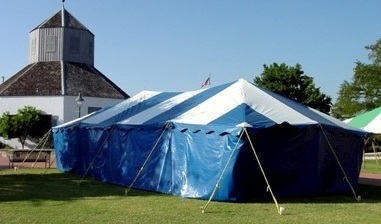 I want to buy a tent that can fit 300-400 people. What's the best size? We will need to know if they will just be standing, sitting in chairs, if tables will be used and the size of the tables.